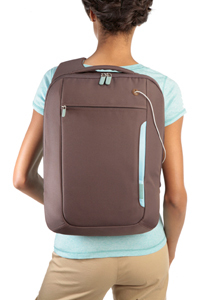 This is the Belkin Laptop Sling Bag in Chocolate/Tourmaline. It is difficult to find a functional laptop case that is also trendy and attractive. The Belkin Laptop Sling Bag attempts to fulfill this dual purpose, but its success is a matter for debate. You will either love this backpack or hate it, depending on your individual needs. 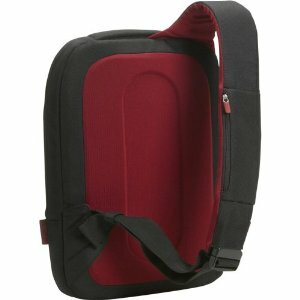 The question to keep in mind is: What do you look for in a laptop case? The Belkin Laptop Sling Bag is shaped like a thin, flat backpack, but with only one shoulder strap that goes over the left shoulder. It tightens snugly about your torso for a secure, non-bouncy fit. The plush inner lining ensures that your computer will be kept safe and free of scratches, and it contains a plethora of small pockets and compartments… most of which you will never need to use. The two larger pockets can fit a few small items, but not much. This bag is definitely not intended for students or professionals who need to carry a lot of material; it will force you to trim down your load to only the bare essentials. The Belkin Laptop Sling Bag can hold a laptop, a small notebook, papers, and a few accessories. If all this poses no serious issue for you, the Belkin Laptop Sling Bag comes in two stylish color combinations for you to choose from: Jet/Cabernet or Chocolate/Tourmaline. If you would rather pass, there are many other backpack laptop cases available that may better fulfill your needs, such as the Belkin Core Laptop Backpack, or the Case Logic Value 17-Inch Laptop Backpack. The Belkin Laptop Sling Bag is a ‘love it or hate it’ item. This backpack is extremely comfortable on some people, awkward and ill-fitting on others. It’s perfect for light usage, and―if it fits you correctly―very comfortable. For $50.00, it’s a good price, but think carefully about how much stuff you need to carry… and by all means, try it on first!